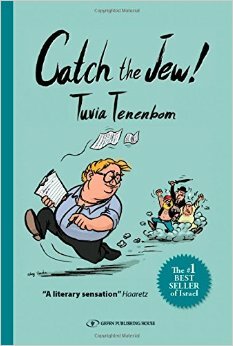 To catch a Jew is a Borat style, Gonzo Journalistic, satirical, patronizing romp through Israel through the eyes of Tuvia Tenebom. Tuvia is raised Orthodox and admittedly shapes his opinions and experiences through this lens. He has escaped from his upbringing in Israel and spent fifteen years in University in the West and calls himself a “Recovering Intellectual”. I am not sure if Tuvia really loves Education, or the Charedi system is so bad that it takes fifteen years to get a degree. I interviewed Tuvia and found him to be a very likeable character although there is a part of Tuvia’s personality that only lives in hindsight, in retelling his experiences and adding his observations. His accent is a mixture of Israeli, and Yiddish, and all the years in the West has made it indistinguishable as any origin. The book follows his exploits into Occupied Territories, meeting Arabs Europeans, NGOs, leftists and many other characters. He interviews the right and left and finds absurdity everywhere. Most everyone he meets he claims is either Western Anti- Semitic or self-hating Jews masquerading as peace loving Human Rights activists. He spends lots of time with Arabs and says he “connects with them on human level”. He has a special distaste for the Europeans who he claims that their entire interest in Israel is age old Anti-Semitism masking as nobility. He saves his deepest loathing for the Leftists Jews who are “self-hating and will do anything to avoid looking in the mirror and seeing who they are”. The book starts off hilarious. Towards the middle you start to feel angry at the ignorance, absurdity, and level of hate and bigotry Israel elicits from so many people. Towards the end, your anger is replaced by sadness as you are overwhelmed with the realization of how hopeless this conflict is, and how unlikely it is to ever be resolved. The book has received rave reviews on Amazon and you can look for his other adventures where he interviews Germans in the same manner and format. The following is an excerpt from the interview with Tuvia and we added a video of actual interviews with the characters of his book in our video section. Q. I will start by asking you the same question you ask your characters. What does Israel mean to you? Define Israel according to you? T. Israel is an idea not just a state for the Jews. The Jews themselves are an “Idea”. It is the spirit that drives Anti-Semitism for thousands of years. I met Neo Nazis that said they can spot a Jew for miles away and did not realize they were talking to one. The point is you can never know who is a Jew, it is an idea. The NGOs come to Israel to fight the Jews before they even met any Jews. Some of them never met a Jew their entire life, but they come there because they hate the “idea of Jews”. Q. Define yourself as a writer? as a person? T. I define myself with one Yiddish word, “Shmendrick”. This is who I am. Q. Did you have fun? Were you ever scared? T. Part of it was fun, part of it was scary but you don’t allow yourself to think about it. Sometimes I look back on the things I did and the places I went and am scared realizing what danger I had put myself in, I could have been dead ten times over, but while I am there I don’t think about it and just do my job. You just bury it deep inside. The moment you think about it, it’s paralyzing. Q. Has anyone contacted you after the book? T. No. Two of the characters tried to dispute the facts in the book and what they said. Btselem, and Dalia Rabin Yitzchak Rabin’s daughter. I fought for five weeks and then showed them the video (see below) and they shut up, and proved to everyone it was true. Everything I wrote can be proven in a court of law. Q. What was the closest you ever got to being discovered? T. Not in this book, but once in Jordan, and in Doha Qatar. T. I was at a dinner party at the home of a Jordanian, and in middle of the party there were about twenty people there. The guy said “ I heeer dat yoo arrr not German , yooo arrrr Joooo”. Everyone was quiet and they all looked at me, and I looked at him back. I couldn’t just deny it because every Jew would just deny it and say “I am not a Jew”. I looked at him and I said “You have thin lips” Who has thin lips? Everyone knows only Homos have thin lips. Who are the Homos? Jews. Jews are the Homos. You are a “ Jew Homo” get out of Jordan. Everyone is now looking at him. Did he have thin lips? No I just said it. Do Homos have thin lips? Could be. In the Palestinian culture if you say something it must be true. 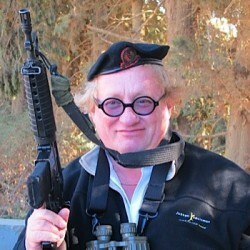 In the Palestinian areas nobody thought I was Jewish and they all knew me as Toby the German. Q. Do you speak German well? How many languages do you speak? T. I speak German with an accent. My German is partly Yiddish. In Germany I am mostly in Hamburg where everyone speaks English. I speak a little Arabic and speak Hebrew fluently. Q. In the book you spend a lot of time with Palestinian Jibril Rajoub, head of the Olympic committee and ex Police investigator. Why do you like Jibril so much? T. You have to actually meet him. He is very charismatic. He’s brilliant, he’s funny, he’s cool, he’s moody, he comes into a room everyone loves him, and he does so many things, he’s so brilliant in the way he does things. I am shocked he didn’t find out I was Jewish. When he says something everyone listens. I am impressed with his dedication. Yes he’s corrupt, yes he’s getting money from the Europeans and he spends it like no tomorrow, but he cares for his people. He fights for his people, he knows how to live the good life yet he doesn’t mind if he gets killed. He’s a leader. Q. You were told many things off the record. Without mentioning the source can you tell us the most interesting thing you heard off the record? T. I have Journalistic standards. Anything that was off the record I take it with me to the grave. Q. You talk a lot about the food in Israel. Is food really that good? What is it about the food in Israel that is good? T. I love food, or else I wouldn’t be so fat. The food is amazing there. The cheeses there , oy gevalt. The bread, the Jachnun, you can’t get that in Beverly Hills, Ah Kapura. The falafel by the Palestinians is heavenly. Q. Has your upbringing affected your personality your fearlessness you opinions? T. I grew up in the Charedi world. I left that world. Many people leave that world and tell you terrible stories of abuse or say horrible things. I would never say that. I was treated very well. I was treated like a Prince. I even skipped five grades. Every Papa wanted me as his son in law. I have nothing against them at all. Q. At what age did you stop being religious? T. I started moving away at fourteen, at eighteen I went to the army, went to Hesder. I left in the early twenties to the United States and stopped observing Shabbos like five or six years later. T. I spent fifteen years in University. That’s why I came to the United States. For my family it was an embarrassment that I was going to College. I didn’t want to fight them so I left for the States. I studied fifteen years in University and then came back to regular life. Q. What part of Orthodoxy were you from? T. I was half-half. On one side we were Misnagdim from the Chazan Ish . My middle name that I never use,”Yeshaya” is named after him. The other side I am Hassidic a grandson of the Radiner Rabbi. My father was a Rosh Yeshiva and I lived next door to R. Chaim Kanievsky. I grew up with them. We called him Chaimke. He was a very good friend of my father. Q. Can you go back? Will you? Are you scared to go back? T. Yes of course I am scheduled to be there next May. Of course not I am not afraid. The Palestinians themselves are not pissed off at me. The ones that are pissed off are the leaders. It is a matter of honor. They were fooled, but they probably cooled down by now. Q. When you were given the nickname “Abu Ali” nickname of Hitler did that bother you? T. I felt excellent. I started the journey as a German and ended up an Austrian. What an honor. Of course personally it felt bad, who are they associating me with, but for the people around them the security it was an honor. It felt good to achieve what I wanted and for the people around getting that nickname meant that I was important, and it helped them to be honest with me and open up to me. Q. Do you believe in God? Religion? T. Well Judaism is who I am. It’s in my blood, I write about it, I run the Jewish theatre, and it’s part of me. I never even changed my name. We believe there is something special to us. Q. What is it about girls that you love so much? Q. You mention many times in the book the stray cats in Israel. You feed them and you talk to them. What is your obsession with cats? T. I don’t know. I love cats don’t ask me why .I never thought I would like cats. The minute you start feeding cats even stray cats, they start associating themselves with you. If they see you on the street they run up to you. To see a creature that you have no relationship with all of a sudden running up to you and showing you affection it’s a wonderful feeling. You feel good. Maybe if I was in Zimbabwe and I started feeding monkeys and they hung around me maybe I would fall in love with monkeys. Q. Do you feel bad or uncomfortable talking bad about Jews? I know you are doing your job but does it make you feel guilty being around people hearing Heil Hitler, or death to Jews? T. No I will tell you why. Who ’m ever I meet even if it’s a Neo Nazi, I try to hook up first of all to the person inside him or her, and find the good things in him or in her. Every one of us is Human. Even our worst enemies of ours is Human. I divide or divorce, or put a barrier between what the person thinks and who the person is. There are many people that would think exactly like me but I would not be able to even spend five minutes with them because they would go on my nerves. They think exactly like me, but still I can’t stand them. Then there are people that are the exact opposite. So I think the moment you divorce between the two and separate the two, and when you interview the person you try to find the good in him and you hook up to it you can connect. The fact that they would not talk to me if they knew I was Jewish is their problem not mine, because I talk to them no matter who they are. Q. You are in media what else do you write? T. I have a column that I write for the Zeit in Germany. I also write for The Forward in America, and I write plays for the theater. Political theatre. I operate the Jewish Theatre in New York. Q. How many copies did you sell so far? It was on the best seller list in Israel for five weeks, it was on Haaretz best seller list. In Germany it was four months on the best seller list.